If you visit Amazon and search for “leadership books” you’ll find over 50,000 results. Why are there so many books about leadership? Maybe it’s because everyone recognizes the importance of leaders. Or perhaps it’s because nobody seems to be able to get it right, so they keep buying more books about it. Bill Bright, founder of Cru, was fond of saying, “Everything boils down to leadership.” We believe him. Our experiences with churches that are discipling men bears this out. Your ministry with men is a reflection of the leaders God raises up in your church. Leadership is an important foundation of an effective disciple-making ministry. Nothing else you do will make any long-term difference without effective leadership. Without committed, involved leaders it all falls apart. Leadership envisions, focuses, organizes, communicates, encourages, equips, perseveres, and celebrates. A ministry built on any other foundation simply will not work. This is hard work, as we’ve said before, but if you are in the game for the long haul, here’s the kind of leadership structure you should consider. “…A cord of three strands is not quickly broken” (Ecclesiastes 4:12). 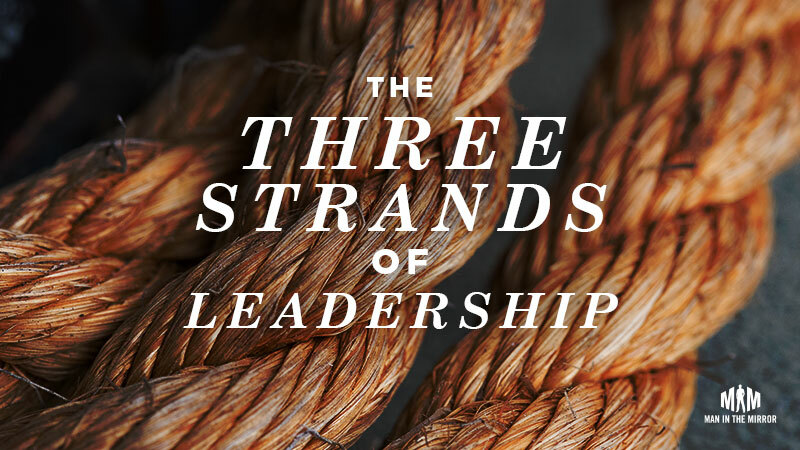 Your ministry will need three strands of leadership to reach its highest potential: the senior pastor, a primary leader for your men’s discipleship efforts, and a team of leaders to support him. You need the proper buy-in at each of these levels to have a well-balanced foundation. Building your men’s ministry without these three strands of leadership is like driving a car with a missing spark plug. The car will still function, but your engine won’t run like it should. It will sputter and misfire, lacking the power of an engine hitting on all cylinders. In short, it limits your acceleration, decreases your top speed, and wastes fuel. Tom is a lay leader in his church. An accomplished businessman, Tom was adept at organizing and influencing. Luckily for his church, Tom also had a heart for small groups. For years Tom labored, with the blessing and public support of his pastor, building up a small group ministry in his church. He prayed, recruited group leaders, oversaw training, organized curriculum, counseled, and worked his heart out. He was able to build a small group ministry in his church with over 100 adults each week. Then, after seven years, his pastor caught the small group “bug.” Suddenly, he realized how effective small groups could be for the spiritual development of his congregation. That fall, on the first Wednesday of the new initiative, over 700 adults participated in small groups. Tom worked for seven years to build a small group ministry with 100 people. Then the Senior Pastor sets a date, preaches a few sermons, reorganizes the schedule, and – voila! – 700 people get involved. Your pastor will ultimately determine where the primary intellectual, financial, and spiritual resources of the church are invested. If the senior pastor is involved in a program or initiative, it will get a budget, staff support, rooms when they need it, and plenty of publicity. Support is not involvement. Our research suggests that support of the ministry by a pastor is good, but involvement is even better. If your pastor takes a personal interest in the process and health of your discipleship ministry with men, you have a huge head start. That’s ironic, because every pastor wants to see his men become disciples. But many pastors have been burned by men’s ministry. In the past they have supported it, defended it, invested their time, and given it creative energy. But men’s ministry didn’t want to work. This was repeated for two, three, and maybe even four failed attempts. So if you were the pastor, and for the fourth time in eight years, some enthusiastic—or perhaps naïve—guy excitedly said to you, “Pastor! I’ve got this great idea! We should start a men’s ministry!” what would you do? You’d smile, and nod, and wish him well. Then you’d just wait. This is not cynicism, just reality. Pastors are responsible to a multitude of constituencies. All of them want the pastor to make the ministry they are passionate about his top priority. So if your pastor does not jump on board at the beginning, that’s OK. Be patient and persevere. There are also some ways you can help your pastor get involved in the men’s ministry faster. Pray for and with your pastor. One idea: Gather your men on Sunday mornings before services start and have a time of prayer for your pastor. Ask for specific requests. And don’t just do it with the ulterior motive of getting him on board. Support your pastor. The men’s ministry leadership team needs to have a reputation of enthusiastic support for your pastor. For example, discover his area of passion in ministry and rally around him to make him even more effective. Inform your pastor. Never let your pastor be surprised by what’s going on in your ministry to men in the church. For example, copy him on your summary emails after meetings and forward him stories of changed lives. Include your pastor. Invite your male pastors to your events, but in the way he wants to be included. He may not want to say the blessing or close in prayer; let him be one of the guys. Love your pastor. Find tangible ways for the men’s leaders to show your pastor their appreciation. For example, set up a lawn care co-op to take care of his lawn for six weeks during the summer to free him up for vacations and refreshment. A pastor who is prayed for, supported, informed, included and loved tangibly by his men will be much more likely to be involved in their efforts to grow closer to Christ. In fact, they will want to participate in making that happen, throwing the full resources of the church behind the effort. It will be good for your men, and good for your pastor. An effective ministry to men needs a leader with an arrow through his heart for the men in your church and community. Someone needs to wake up in the morning thinking about how the men in your church will grow in their faith. Does he have to be a paid staff member? No. Could he be? Certainly. It would be great if your church paid a minister to devote a major portion of his time to men’s ministry. If it’s the Senior Pastor, even better. But for most churches, the men’s ministry leader will be a layman. First, he should be a man who loves God. Your men’s ministry leader should be modeling what he hopes other men to become: a disciple (follower) of Jesus Christ. He should be growing spiritually, spending regular time in the Word, and able to talk comfortably about his faith with other men. He doesn’t need to be a Bible scholar or a great preacher or teacher. That’s the pastor’s job. While your men’s ministry leader needs to be in the scriptures regularly, he doesn’t have to be able to translate from the original Greek. Second, he should have a heart for men. Leaders in your church have different passions and callings. The men’s ministry leader must have a passion for reaching and discipling men. And this needs to be his primary area of ministry in the church. Third, he should have the right set of gifts to lead other leaders. How can you tell? Look for a man who has the respect of other men. This does not necessarily mean he needs to be well-known, or “popular.” But frankly, there are too many men’s leaders out there who are “self-selected.” They have the passion, but not the gifts. Be careful not to promote someone past the level of their competency as a “reward” for faithful service. The worst thing you can do is stop someone from ministering effectively where they are so that they can lead ineffectively in a new position. Surrounding the leader, should be committed men who share many of the attributes of the leader himself. The height of your men’s ministry will be determined by the depth of your leadership. Your men’s ministry will become whatever your leadership team becomes. In other words, your leadership team should look like the guys you are trying to reach. If you want to reach men of all ages, your leadership team needs to have leaders from several different generations. If you want to reach men of different ethnic backgrounds, your leadership team needs to be ethnically diverse. Everyone on your leadership team does not have to have the same level of spiritual responsibility or authority. Some members can play more of an implementation role while you are mentoring for leadership. So, if you want to reach men at various levels of spiritual maturity, you might want to invite some guys at various places on their spiritual journey. Finally, don’t turn your leadership team into an “operations” or event committee. Your leadership team should be a prayer and strategic planning team, not a “doing” team. If you are planning a men’s BBQ, then the leader who is responsible for the food should not decide on the menu, make a shopping list, buy the groceries, cook the food and do the dishes. Rather, this is an opportunity to recruit men to these various tasks so they can begin to catch the vision. Bringing sodas is building the Kingdom, but most men won’t know it unless a leader shows them how their contribution reaches men with the gospel. One question we often hear is, “How big should my leadership team be?” You might be tempted to decide by thinking through potential areas of responsibility. A small groups coordinator, a big events coordinator, a retreat coordinator, and so on. Sounds pretty well-coordinated, doesn’t it? But this approach is dangerous. You can’t decide how big you want your ministry to be and then recruit a big enough ministry leadership team to accomplish it. Men’s leaders often tell us they are exhausted. It doesn’t take long to discover they are trying to do small groups and a retreat and a softball team and a bus to PK and an outreach event and on and on. Why? Because they think that’s what men’s ministries are ‘supposed’ to do. This brings about two problems: First, they’re burning themselves out. Second, nobody else wants to join the leadership team because they see how much work it is. “The size of our ministry determines the size of our leadership team” is hazardous. Instead, look at it this way: “The size of our leadership team determines the size of our ministry.” God has placed certain men in your church with the desire to reach and disciple men. But for most of them it’s not some vague calling; it’s specific. Some feel passionate about softball, some about getting guys to go to Promise Keepers, some are into small groups, etc. Your ministry should flow out of the passions of your leadership team. If you don’t have a guy who’s passionate about retreats, then don’t have a retreat. Believe it or not, “Thou shalt take thy men into the wilderness to retreat” is not actually in the Bible. The men God has given you are not assets to accomplish the tasks set forth in your strategic plan. They are leaders. Their passions are wonderful clues to what God would have you do for the men of your church. If you allow them to pursue their calling they will be more engaged, your ministry will be more effective, and, best of all, more leaders will be attracted. Your ministry will grow naturally, and in God’s own time. 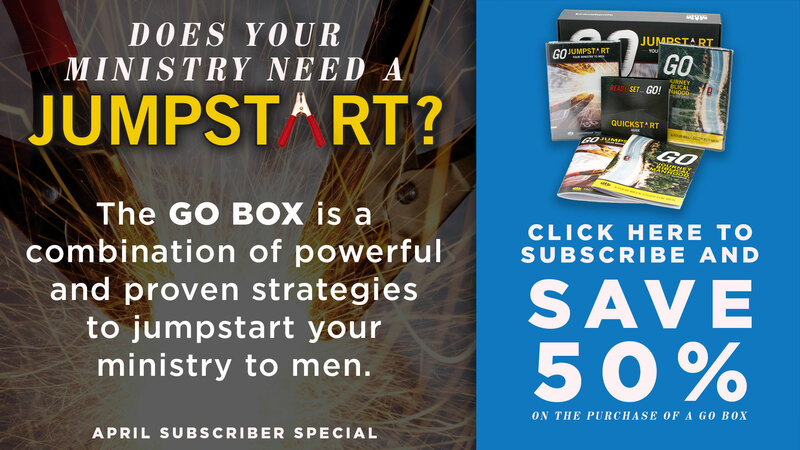 If you’re looking for ways to get started in your church, find an Area Director near you to get in-person help or check out our resource GO: Jumpstart Your Ministry to Men. BIG IDEA: The three strands of leadership for your ministry are the senior pastor, a passionate leader, and a committed leadership team. ← Messages Your Church Sends to Men ← Is The Reach Of Your Men’s Ministry Wide And Deep?